Staff at a bank in Uttar Pradesh has been blamed for allowing termites to eat their way through banknotes. 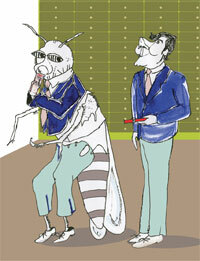 The insects are believed to have chewed their way through notes worth some Rs 1 crore. “The branch management has been found guilty of laxity due to which the notes were damaged by termites in the Fatehpur branch of Barabanki district,” State Bank of India’s chief general manager Abhay Singh told the news agency Press Trust of India. He said that identity numbers on majority of the notes were still intact, which meant that they could be replaced. Directives have now been issued to branches that stored currency in strongrooms to ensure that the condition of the cash is checked every two months, he said.